Spring is here! 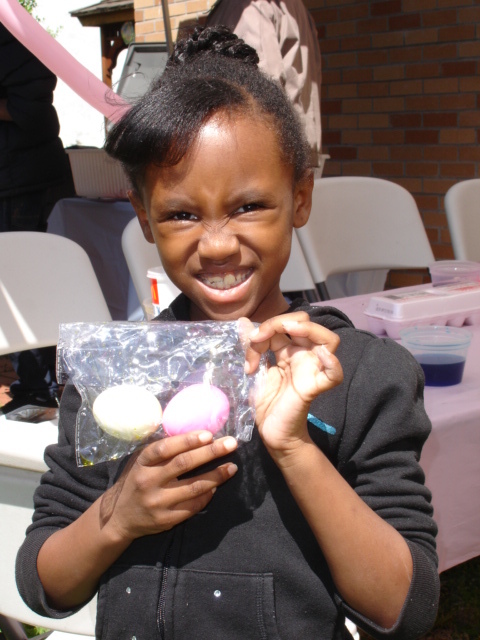 And to celebrate the Clayton Williams Community Garden opened its doors for the 2012 growing season with an Easter Party on Saturday, April 7, 2012. With support of local business like Bravo (on 8th Ave between W. 128th & W. 129th) and the Deli & Fruit Bodega (at the corner of W. 126th and 8th Ave) – the party was a success! 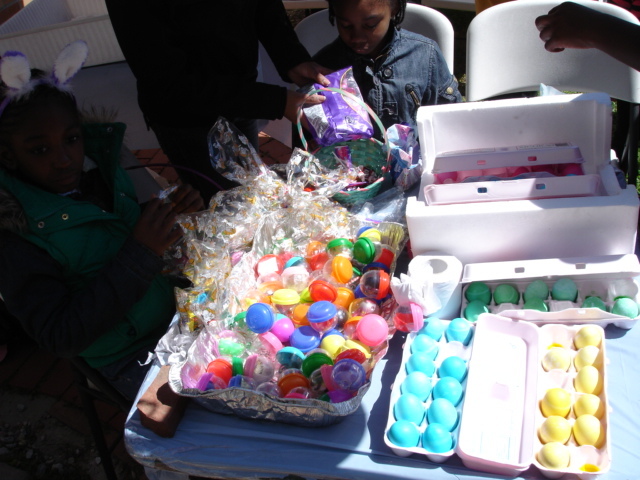 There was an Easter Egg Hunt, a table to Dye Easter Eggs, Music and Refreshments. 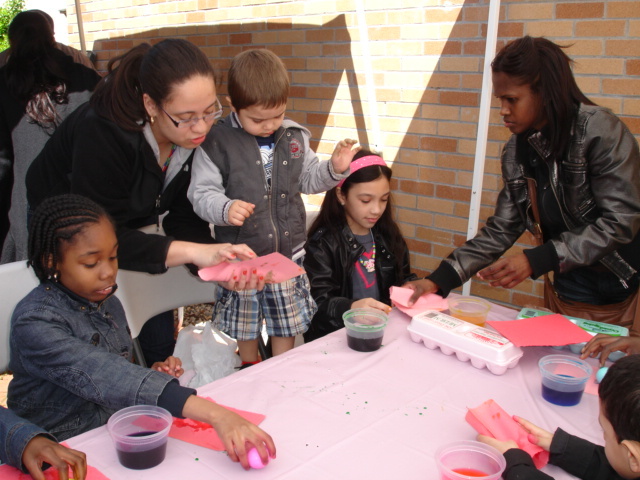 With nearly 400 eggs to dye and hunt, not only did the children enjoy the event, but the parents did as well. 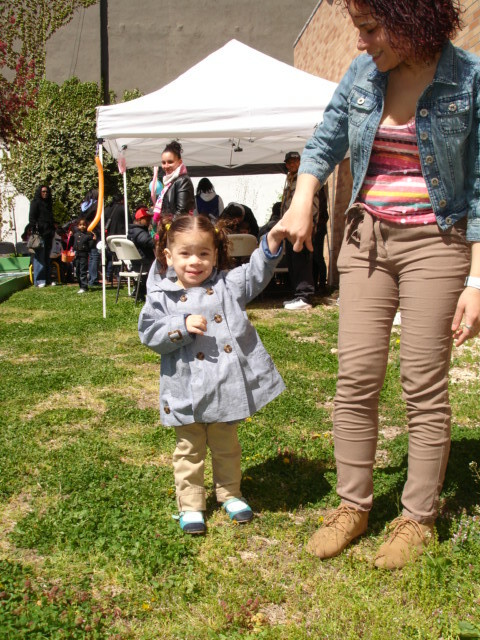 The weather was great and the opportunity to enjoy the garden by the community was highly appreciated. 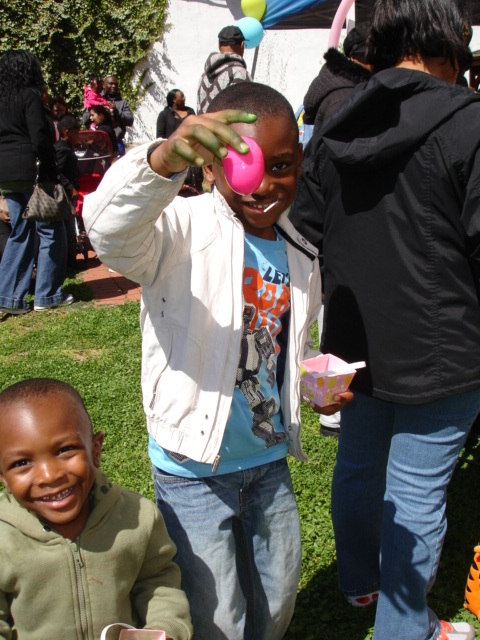 Many of the parents and children expressed how much fun they had and thanked the garden”s members for allowing them the opportunity participate. 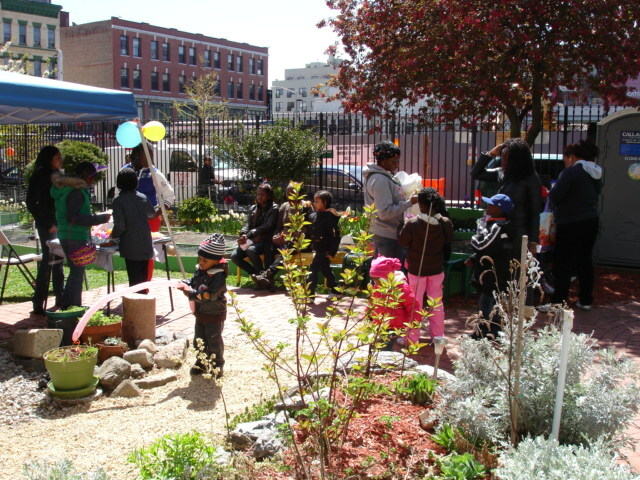 For information about upcoming events at the Clayton Williams Community Garden, please email members at ClaytonWilliamsCG@yahoo.com. 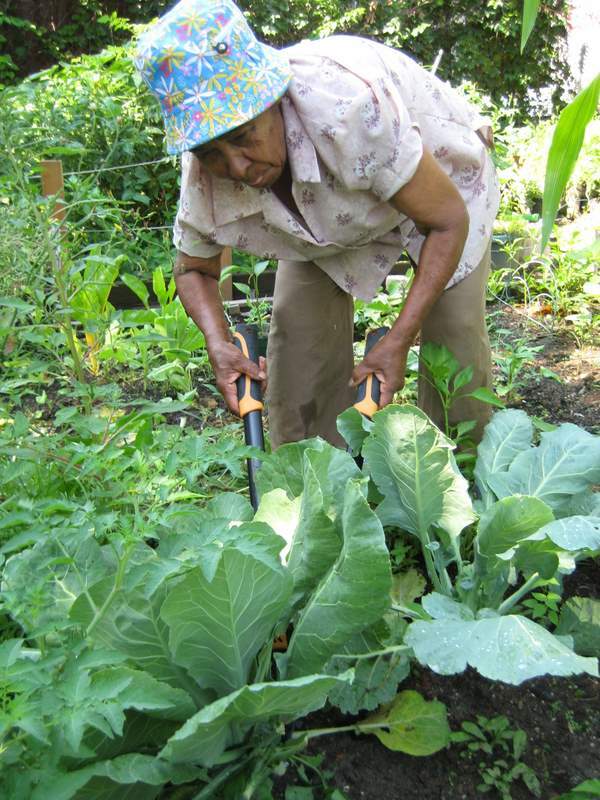 Ten years ago gardeners Olga and Carmen Rodriguez moved back to Puerto Rico entrusting Palmas Del Caribe Community Garden to Alfonso Rodriguez and Julio Medina. The strawberry patch that Olga started in 1972 remains today a permanent fixture of the garden. The garden is located on Eagle Avenue in a fraction of the footprint of the former Hupfels Brewery. The brewery was in operation from the 1860’s to the early twentieth century and was one of many that stood in the area known as Grove Hill. The highest point of the hill was hollowed out as cool caverns where the beer was stored to age. As a result of prohibition in the 1920s the Hupfels family turned the brewery into a mushroom farm. After a number of years the lots began to take on the dimensions that we now see today. Parts of the brewery were replaced by; housing, a school, a social club, a storage facility, a construction company and the Palmas Del Caribe Community Garden. The original smokestack, a number of old unwieldy retaining walls and a decrepit old warehouse, remains. “This garden is like our second home”, said Alfonso Rodriguez recently, we come here every week and spend time talking about the old days and sharing news of the neighborhood. We grow vegetables and grapes, celebrate Father’s and Mother’s Days and occasionally we roast a pig for the community. Gardener Ballona , who would like to start a music program at the garden to teach neighborhood youth to play the guitar, often stops by and leads the other gardeners in a sing-along of Salsa Romantico songs. Salsa Romantico is a soft form of salsa music that emerged between the mid 1980s and early 1990s in New York City and Puerto Rico. Community members stop by and listen as the sweet sounds bring them back to bygone days in the Bronx and Puerto Rico. The fall is a great time to plant new shrubs and get them settled in the ground before the frost arrives. Recently Sherman Avenue Gardeners, with support from NY Cares hosted a workday with twenty-five Barclays Bank volunteers, where they weeded a large area in the shade of a willow and planted; pink and white astilbes, delicate cat tail-like cimicifugas, a heavily budded rhododendron and a variety of ferns and variegated euonymuses. They also built tables and benches, which will come in handy for the garden’s upcoming annual Halloween celebration. The plants were purchased from Larchmont Nursery with funds donated by Barclays. As luck would have it Larchmont threw in several flats of begonias and impatiens with the order so Sherman gardeners will be able to enjoy a little more color at the end of the growing season. Bronx Green Up generously assisted by transporting the plants from the nursery, donating 20 bags of mulch and setting up a compost system. Many community members came by to express their delight and look forward to spending many warm fall days in the garden. On a recent Thursday afternoon where rain threatened to spoil the day, 40 American Express volunteers toiled away at Clayton Williams and Five Star, Gardens. This feat was the result of a great deal of planning and coordination between NY Cares, The Manhattan Land Trust and American Express Staff. 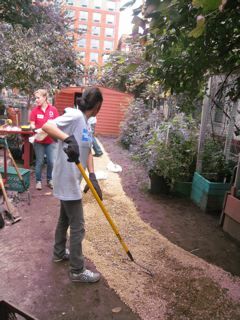 Clayton Williams gardeners had been struggling with a muddy garden path all season and longed for a solid gravel path. 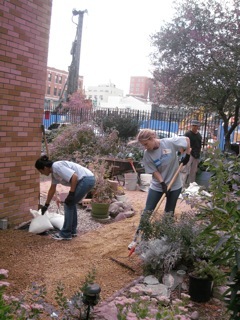 In addition to the installation of the gravel path volunteers worked alongside gardeners to rat-proof the periphery of the garden and weeded and mulched all flowerbeds. Work simultaneously occurred at Five Star Garden several blocks away where volunteers sand-grouted a brick patio, prepped an area to be planted with grass, planted evergreen shrubs and waterproofed the gazebo. When it began to rain halfway through the workday, volunteers donned rain ponchos and continued to work. In the end, the sun came out and saved the day and a great deal of work was completed at both gardens. 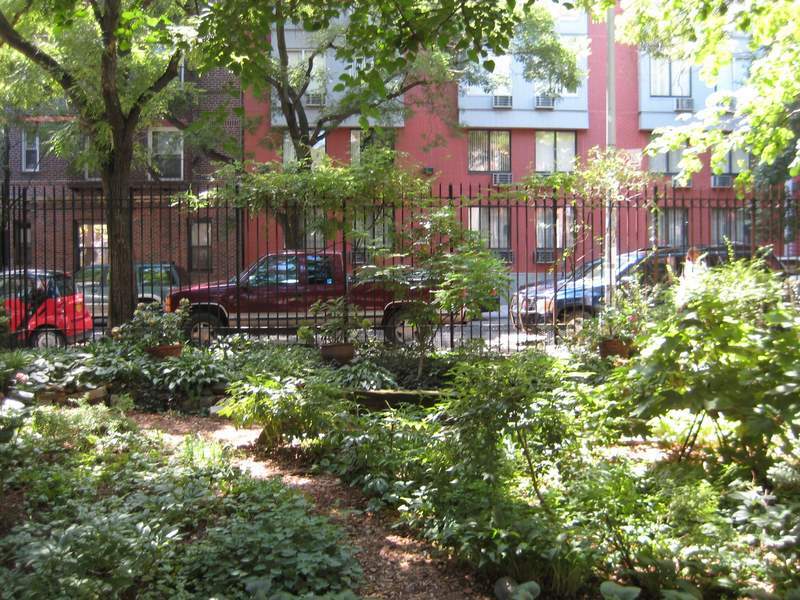 For the past year the Bronx and Manhattan Land Trust has been honored to work with Peter Shenk Koontz. Peter arrived in NYC from his home-state of Indiana last August and came to BLT and MLT via his Vista sponsored position with the New York City Coalition Against Hunger. He enthusiastically jumped into his role and wore many hats at the Bronx and Manhattan Land Trusts; Blog and Database Developer, Public Relations Guide, IT Expert, Community Organizer, Neighborhood Network Founder, Carpenter, and Urban Gardener. In the year that he served with us his commitment and dedication touched the lives of many Manhattan and Bronx residents. Later this month Peter and his wife Kelly will travel to Afghanistan where they will begin three years of service with Mennonite Central Committee. They will be working with an Adult Education Program and serving as ‘Adult Peacebuilding Education Coaches.’ They will be partnering with an NGO that has been serving Afghans for the last 45 years and is the longest continuously serving, capacity building NGO in Afghanistan. We wish Peter and Kelly success in their future endeavors with MCC and look forward to the day that they return to New York to visit the lifelong friends they’ve made here. Friday August 12th was a busy day at the Roberto Clemente Community Garden. With the assistance of 25 volunteers from the Bank of Tokyo we built two picnic tables and four benches. We also waterproofed the gazebo and planted lots of perennials and annuals in the flower bed along the front of the garden. Thanks so much to all of our volunteers and gardeners, the garden looks amazing! 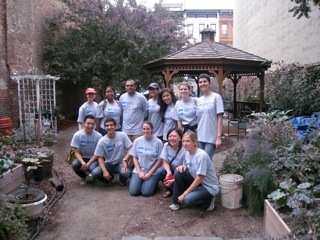 We’ve been working throughout the summer on some projects at the Lower East Side People Care Garden. We have had several volunteer groups, including a regular group from the summer day camp program from Henry Street Settlement. We have been working on a variety of projects including building a new picnic table and benches, painting old benches, waterproofing garden beds, pruning, and other general garden cleanup. Thanks so much to all of our volunteers for their hard work! 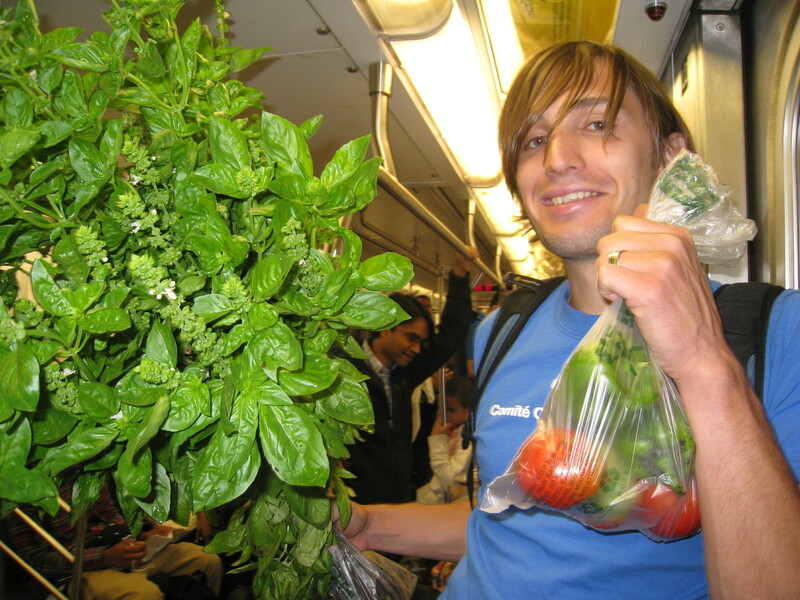 Gardeners are harvesting lots of vegetables these days, check out the pictures!